One of the fastest-growing areas of Greater Vancouver is Burke Mountain (in northeastern Coquitlam), which now has an eclectic mix of modern homes as well as a shopping plaza known as Meridian Corner. The shopping plaza, albeit small, contains all of your usual businesses: a bank, a pharmacy, a fast food vendor, and a sushi restaurant. There is no grocery store, but who needs groceries when you have sushi? Hiraku Sushi, a Korean-operated Japanese restaurant, first caught my attention when I saw its sparkly lights as my dad was driving by the area. When I walked into the restaurant at about 4 p.m. with my dad, I was quite astonished by how popular the restaurant had become. There were 3 sushi chefs at the counter, 3 servers, and several other chefs in the back. The dining area, which was at least moderate in size, was half full, and by the time 5 p.m. came around, the restaurant was truly bustling with activity. The gentle piano music along with the clean, modern decor made for a nice, comfortable atmosphere. The Appetizer Sashimi contained 3 pieces of tuna and 2 pieces of salmon. The sashimi was cut into very large and generous pieces. The Tuna Sashimi melted in my mouth, but had a slight fishy taste. 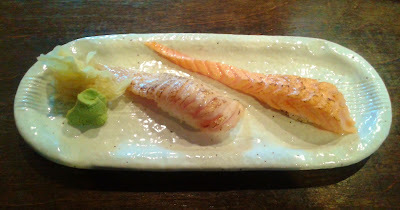 The Salmon Sashimi was cut thickly and had a delicious, buttery flavour. The grilled versions of the tuna and salmon were just as generous. Instead of being thick, the grilled tuna and salmon were cut into very long pieces. Add small ikura eyes and you can have some beautiful grilled toro nigiri dragons. Or snakes. The Grilled Tuna Toro Sushi was slightly crispy on the outside, but had a soft texture underneath. A dab of sauce would help bring the flavours alive. The Grilled Salmon Toro Sushi was slightly overseared, but remained juicy. The most expensive special roll on the menu ($12), the Burke Mountain Roll consisted of prawn tempura, cucumber, avocado, yam tempura, sockeye salmon, unagi, green onion, and tobiko. 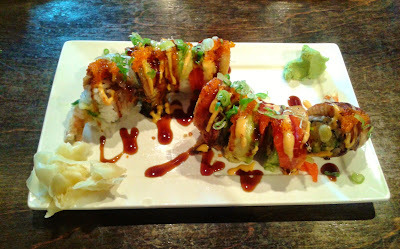 My dad and I both enjoyed this roll, which was a tasty mix of umami flavours. The tempura was well-executed with lightly crispy batter, while the cucumber could be cut into smaller pieces to avoid being too crunchy. The sockeye salmon and unagi were both fresh and adequately featured. To fill my dad up, I got him the Salmon Teriyaki, which was served with a small bowl of steamed rice. The salmon was nicely grilled and the bean sprouts below were adequately dressed with teriyaki sauce. The quality of the salmon itself was so-so, but the decent preparation kind of made up for it. Of course, my dad couldn't finish all of the teriyaki, so I ended up stuffing myself full too. The service was adequate and the food was consistently executed at an above-average quality. The pricing of the dishes was very reasonable, and there were a lot of items on the menu that appeared to be worth trying. 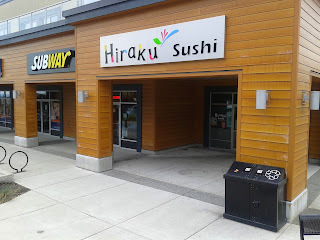 Compared to other sushi restaurants in Coquitlam, Hiraku Sushi has quite a good balance of everything I look for in a restaurant, and I will likely make multiple repeat visits in the future. Sounds like you and your dad enjoyed this dining experience. I love tuna sashimi made with green onions, serrano peppers, lime, soy sauce and of course fresh tuna. I tried making it myself, but it never tastes as good! I used to hesitate when a restaurant was small from the outside, but sometimes these places make the best food. That sounds like a tasty combination! I found quite a few small restaurants that make good food too, and Toshi (in Vancouver) is a good example.